Dave Brown was a compelling force – a dedicated activist – who battled the “unscrupulous” for decades. He was our hero – and, his legacy lies in the Santa Monica Mountains that he so loved – in his efforts to preserve and protect our beloved wildlands and wildlife. Dave was a fighter among fighters – the longest and one of the most dominant. His encyclopedic memory held vast reserves of knowledge. At any given time Dave could recite specific dates and details of events/battles that both compelled and continually captivated us. He was a history teacher, an Advisory Committee Member of the Santa Monica Mountains Conservancy and a former Planning Commissioner. He was our friend, partner, a leader and a trail blazer. We miss you Homer. 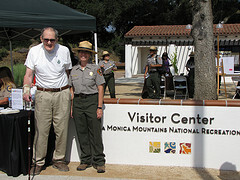 You will always walk the Santa Monica Mountains in our hearts …..
See this 2 1/2 minute video of Dave with Supervisor Zev Yaroslavsky at the dedication of the Las Virgenes Highlands Park. Yes, we’re certain you “walked up to heaven through a place like this Dave” ….. I was very sorry to hear of Dave Brown’s passing. While it was not unexpected, this has left a great void in the lives of those of us who have toiled in the vineyards of Santa Monica Mountains protection and preservation. No one was a greater guardian of our natural resources than Dave Brown. He had the unique combination of vision and practical acumen to implement that vision. So many of the environmental achievements in the western part of Los Angeles County over the last three decades have Dave Brown’s fingerprints all over them. He will be sorely missed, both on a public policy level as well as a personal one.